Having spent a good few years building, operating and exhibiting an American HO scale switching layout, in mid-2017 I decided it was time for a change. I still like American outline and being a fan of TT from my British 3mm scale modelling years, I started looking at what was available in 1:120 scale American TT. The answer was not much. Certainly not in the UK, or the US for that matter. The handful of suppliers of American TT are based mainly in Europe and have a limited choice of ready-to-run or kit offerings. But a short switching layout with a handful of industries doesn’t need that much stock; nine or ten freight cars would more or less fill it up. And based on past experience, if I bought much more I wouldn’t use a good half of it anyway. 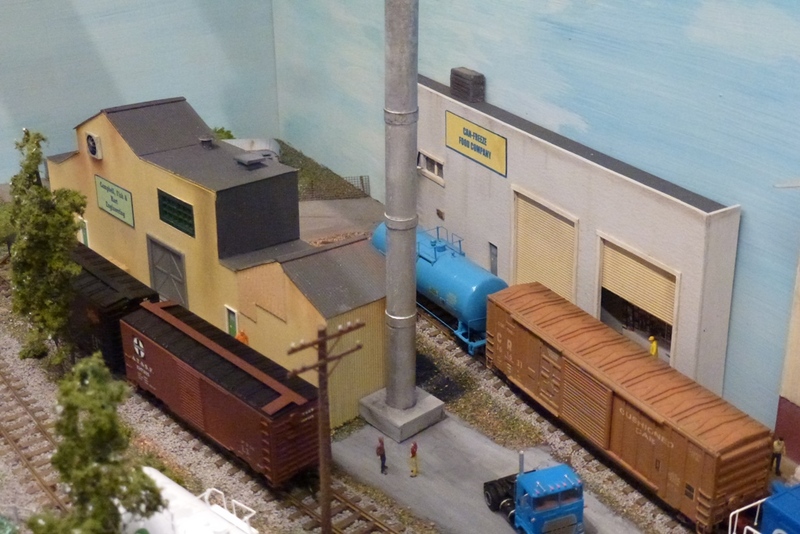 So having sold my HO layout and a good amount of stock, I ordered a few American TT items, more of which later, and started designing a new layout. 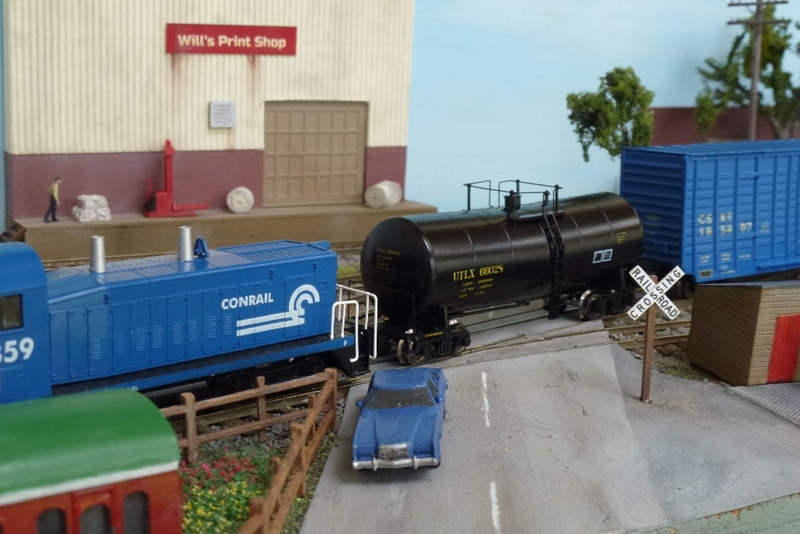 The small industrial park straddling Naples Street is served by a branch of Conrail in the imaginary town of Sorrento, Illinois, in the late 1970s to 1990s. A mixed bag of rolling stock makes an appearance, moved around by a couple of small switchers. Naples Street itself runs diagonally across the tracks. There is a mix of boxcars from different eras and to justify this I have imagined that short boxcars with roofwalks weren’t phased out in the 1970s but lasted over a decade longer. The track plan is very simple – four sidings off a central run-round loop, each with room for two or three freight cars. 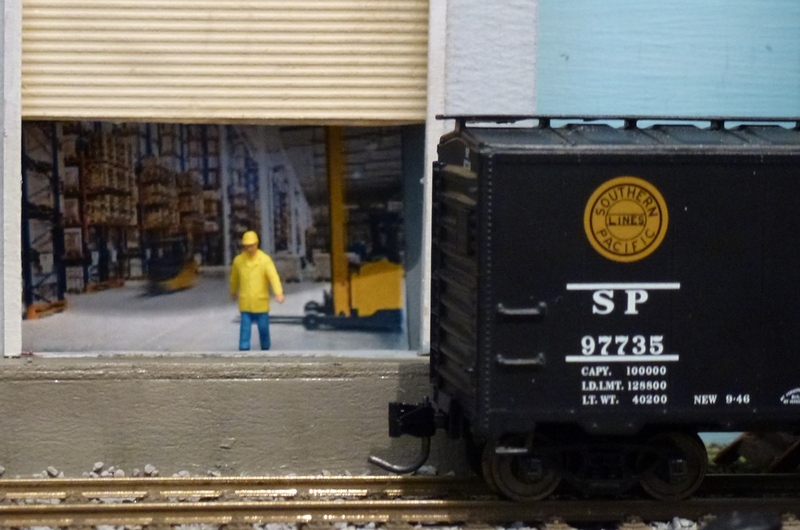 The layout measures 40 inches by 11, and the fiddle yard adds another 20 inches. 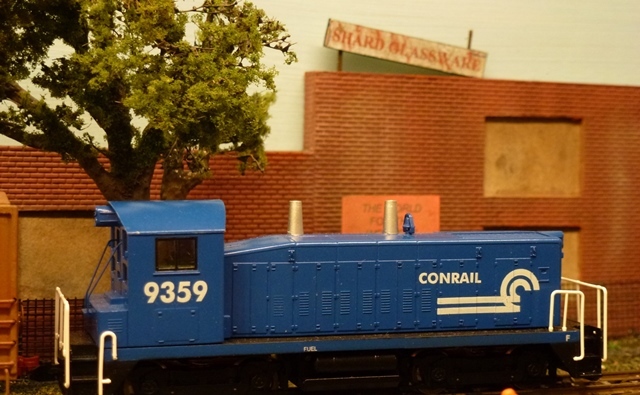 I originally designed the layout without the run-round and with an extra siding but decided to incorporate the run-round for a bit more switching flexibility. 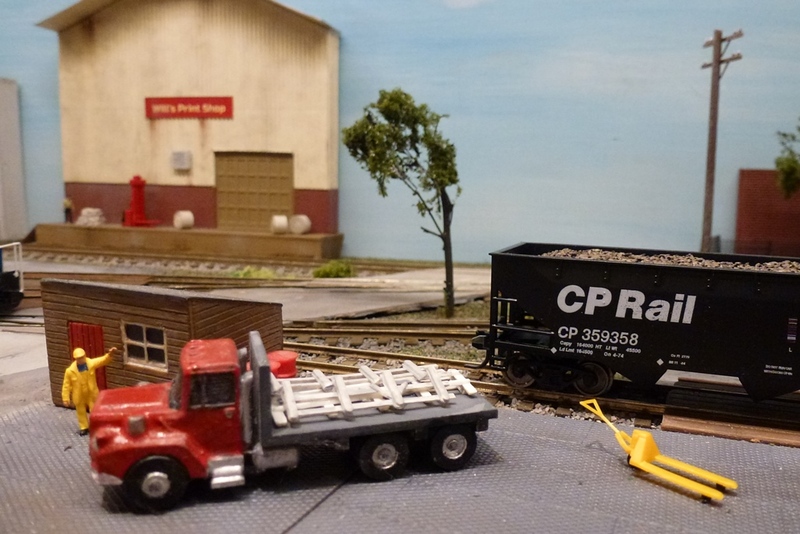 As it doubles as a siding for switching anyway, I haven’t really lost anything. Track is Peco HOm, left over from my 3mm modelling days. The ties (sleepers) are a bit on the chunky side for TT but look ok covered in paint and ballasted. 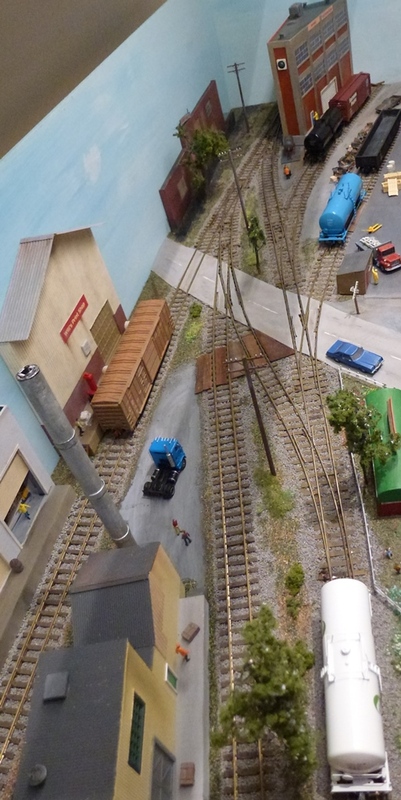 The gaps between the ties would be too wide for a mainline but are fine for a set of industrial sidings. The turnouts are a combination of Peco and hand-built with radii varying between 15in. and 20in. They all have live frogs, and like the track, are mostly left over from previous layouts. The exceptions are two turnouts I built myself, and which, much to my surprise, work without problems. All turnouts have their switchblades electrically bonded to the adjacent stock rail, the hand-built ones by design, the Peco ones through modification. This means that all frogs need to be electrically isolated from the switchblades and that their polarity needs switching according to which way the points are set. 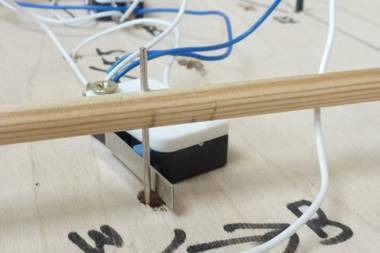 This is done by using under-baseboard pushrods, each of which works a microswitch as the points are changed. 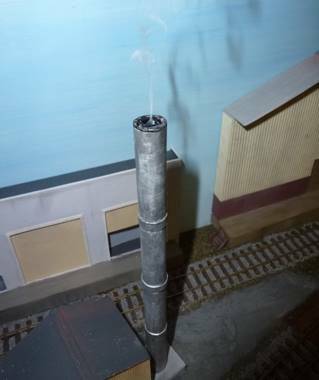 The pushrods run from front to back of the layout so the points can be changed from either side, depending on whether the layout is being operated at home or at a show. The locos are near-identical EMD switchers, an SW8 and an SW1200, one lettered for SOO and the other for Conrail. They are made by Czech company MTB and were supplied by Zeuke in Holland. They come with an NEM 651 DCC socket, which enabled me to easily fit a Zimo MX622N decoder in each. They both run very smoothly. 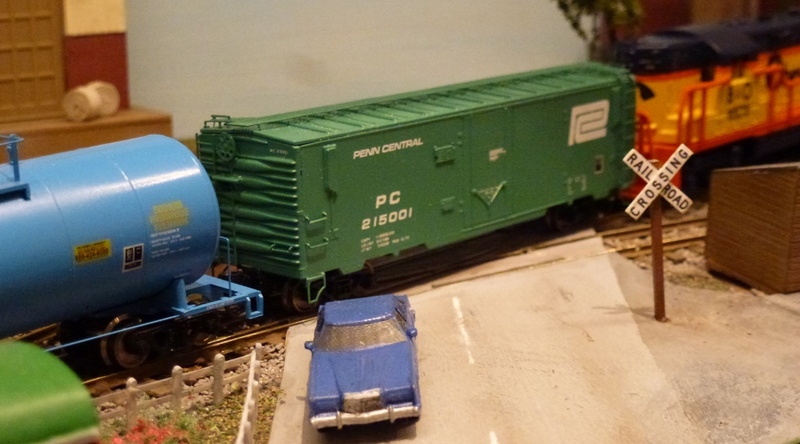 Sound for the locos comes from two MRC under-baseboard diesel sounders, which produce the right sound for EMD equipment. A bit of a compromise, but they will do until I steel myself to fit sound decoders and speakers into these small locos. I know it has been done! As there is only one loco in operation at any time, there is no need to give them different DCC addresses and to keep things simple I have left the addresses at the factory default of 3 rather than assign loco numbers to them. 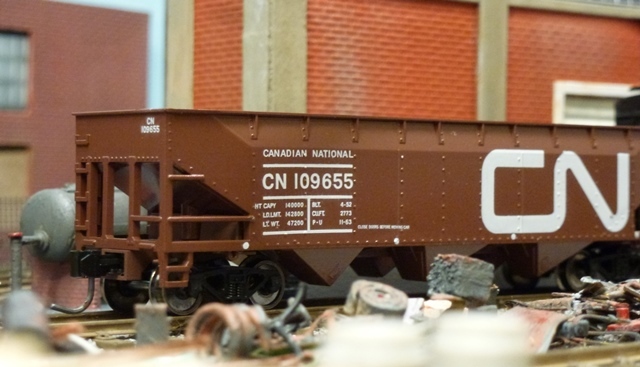 Stock comprises two tank cars, four 40ft boxcars and a 60ft high-cube boxcar, all from Zeuke; a flat car and 50ft boxcar from Lok-n-Roll in Germany, made from kits; and a 3D printed gondola from Shapeways courtesy of TT Nut. The Lok-n-Roll kits come complete with trucks and wheelsets and just need couplers. 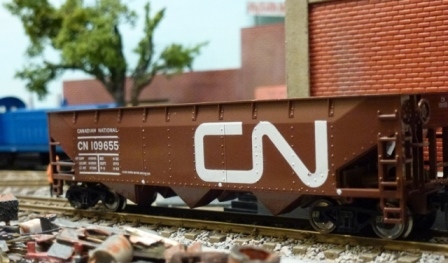 Lok-n-Roll supplied these, and also wheelsets and couplers for the Shapeways gondola. 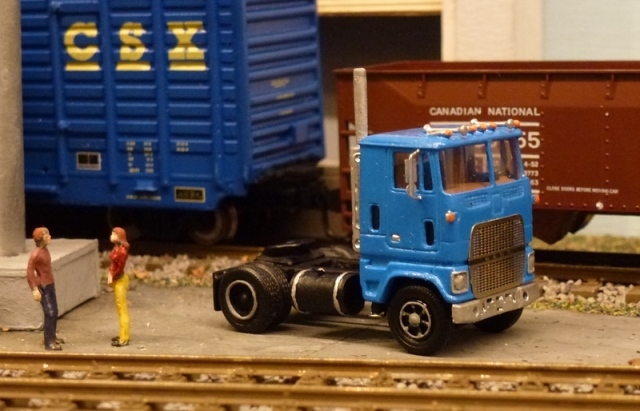 I also bought some Shapeways brake wheels from Bone Valley Scale Models. Couplers are either Kadee 713s or 714s, the difference being in the colour – rust or black. They are for HOn3 stock but are also perfect for TT. They work well but are fiddly to assemble and need much patience; the springs used are even smaller than those for HO, and do not come ready fitted. Luckily a few spares are included! I have fitted all stock that was not ready-to-run with home-made decals. 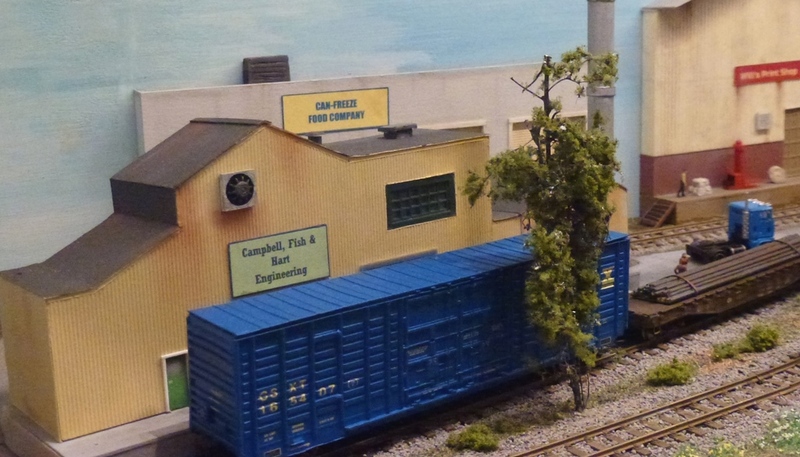 Like the stock, American TT buildings are in short supply, whether ready-built or in kit form. 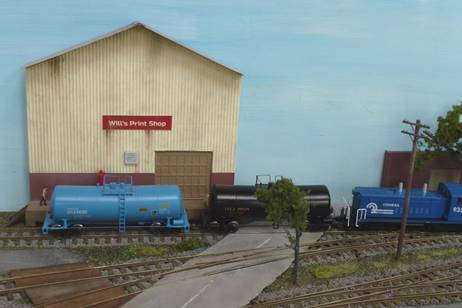 A couple of card kits are available from Zeuke (a station building and a small warehouse), and you may be able to get away with HO or N scale kits from the likes of Walthers or Pikestuff, as these are sometimes close enough to 1:120 scale to be acceptable. The most crucial factor is probably door height – if it’s around 16.5 or 17mm, or you can make it so, it will do. 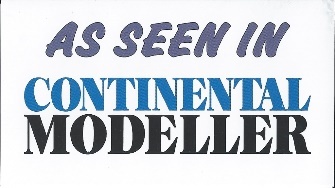 Short of finding what you want, one alternative is to buy TT scale plastic kits from European companies like Auhagen and convert them to something a bit more American. Another way is to download printable kits in PDF format from one of the many suppliers and print them out onto paper at the right scale. Or you can scratch-build. Scratchbuilding is not that much harder than cutting out and assembling a downloaded printable kit. Embossed plastic sheet and corrugated paper give a more 3-D look than flat prints, and you also have the advantage that you can make something exactly to suit the space you have and which is based on any prototype you can take or download pictures of. The buildings on Naples Street were made from a combination of embossed plastic brick sheet, plastic strip, card and corrugated paper, painted with various brands of acrylic and enamel modelling paints, and weathered with pastels. Most of them are loosely based on photos of actual buildings in Illinois. 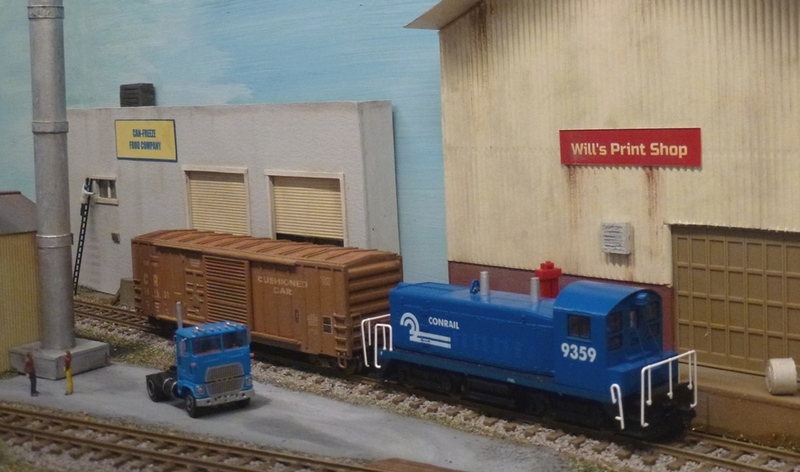 Some are detailed with left-over HO windows and doors from Walthers. The personnel doors and some of the factory windows were designed using Microsoft Excel. 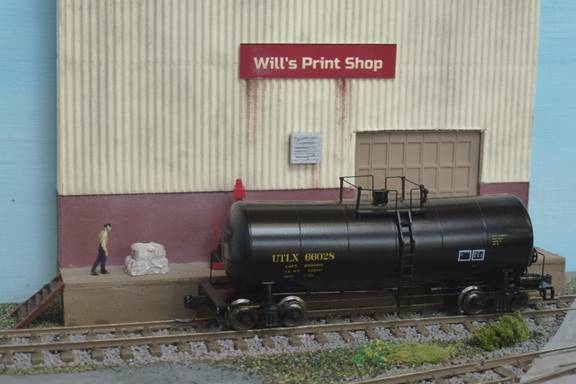 The only buildings I didn’t make myself are Clara’s Diner and the small workmen’s hut, which are 3mm scale resin castings. They are not prototypically American but I like to think they more or less blend in. 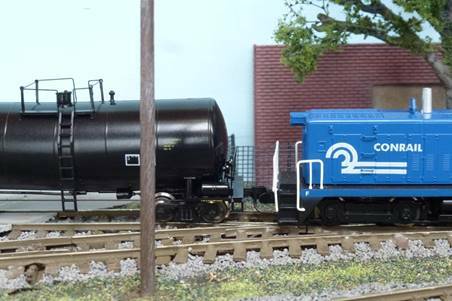 The oil tank outside Napoli Distribution is one of two from a Ratio N scale kit. The backscene is made from 5mm ply, screwed into the back and sides of the baseboard, and covered with poster paint to give the effect of streaky cloud against a blue sky. The lighting is a self-adhesive LED strip fixed to a removable wooden frame attached to the layout’s side panels. 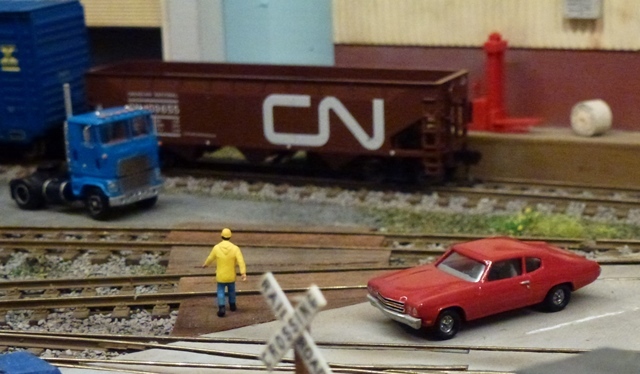 Three of the road vehicles are via Shapeways: a Ford Thunderbird and a Ford Ranchero from Madaboutcars and a Mack truck from Stony Smith Designs. All the US autos which Madaboutcars featured on the Shapeways website came in pairs but when I explained I only wanted two, both different, they changed the design to accommodate me. The world of 3D printing has been a revelation. The Ford CL-9000 cab and the 1970 Chevrolet Malibu are both ready-assembled from RailTT in the Ukraine. The figures are from the Preiser range, both painted and unpainted. As the setting is industrial there are plenty blokes around wearing serious clothing. 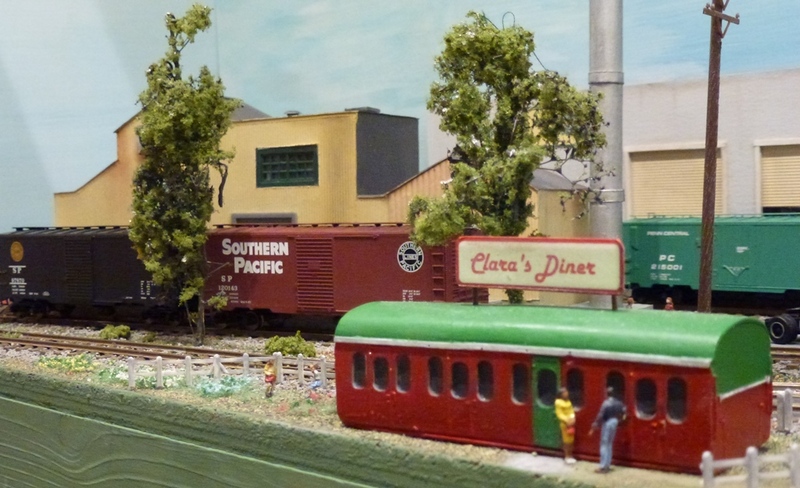 There is no call for passengers around here but Clara’s Diner attracts a few non-railway customers from nearby because the food is so good. The chimney at Can-Freeze Food Company was made from rolled-up paper and contains a Seuthe 117 smoke unit wired to a timer, enabling spectators to make it smoke for a pre-set time by pressing a button on the front of the layout. On cold days the workers at Napoli Distribution like to keep warm by gathering round a glowing brazier in the yard. There are plenty industries to switch. Along the back, over the road from a defunct and forlorn-looking glass factory, we have a printer and an engineer, while to the front are a food processor, a general goods distributor, a scrap dealer and a team track. 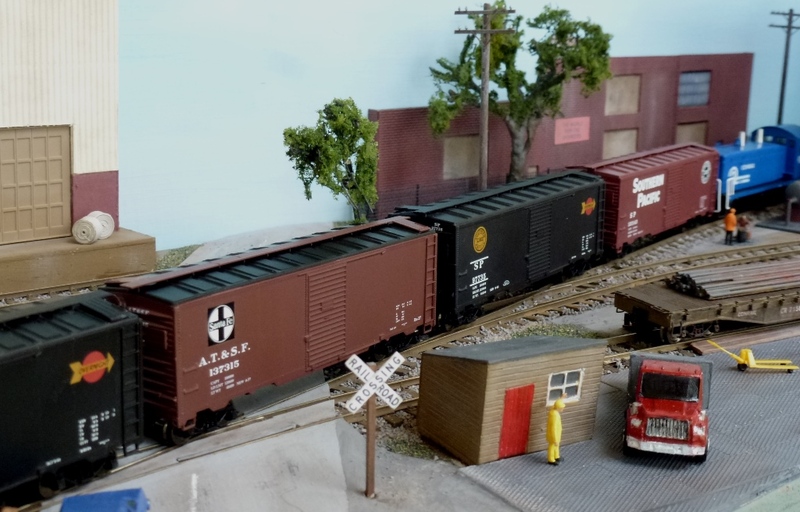 Operating the layout is a matter of assembling a short train of two or three freight cars in the fiddle yard, pulling or pushing them onto their various spots, and picking up cars already spotted, making use of the run-round where needed. Each location can accommodate up to two spots depending on car length. 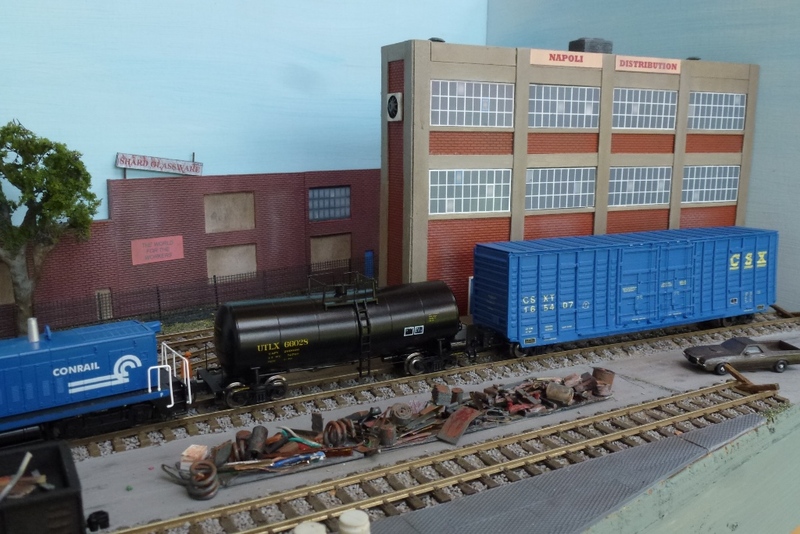 For the most part there is ample switching room, the exception being the lead to the team track and scrap dealer, which only allows for one car to be removed or spotted at a time, meaning that even swapping one car for another is a multi-step operation. Keeps the crew on their toes. I don’t use car cards or waybills, but for the operationally minded I have written a switchlist generator program, which produces switching moves in list format or in a basic car card/waybill style. Click here for instructions. I am contactable on showerydan@live.com should anyone have comments or queries on its use. American TT is rare – even in America – and products can be hard to get hold of. Here are some links I found useful to get me going. ttnut – an invaluable forum with a truly international character, where you will find answers to most of your TT questions. 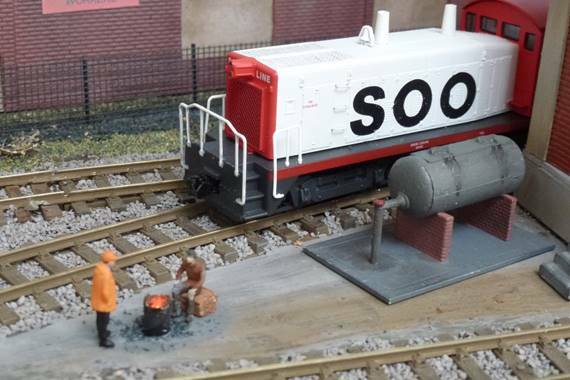 Zeuke-TT - Dutch-based suppliers and manufacturers of a small range of locos, freight cars and buildings. Lok-n-Roll - German-based suppliers and manufacturers of a small range of locos, freight cars and accessories. RailTT - a supplier of road vehicles from various eras, based in the Ukraine. Orders can be placed via arseny@arseny.spb.ru. 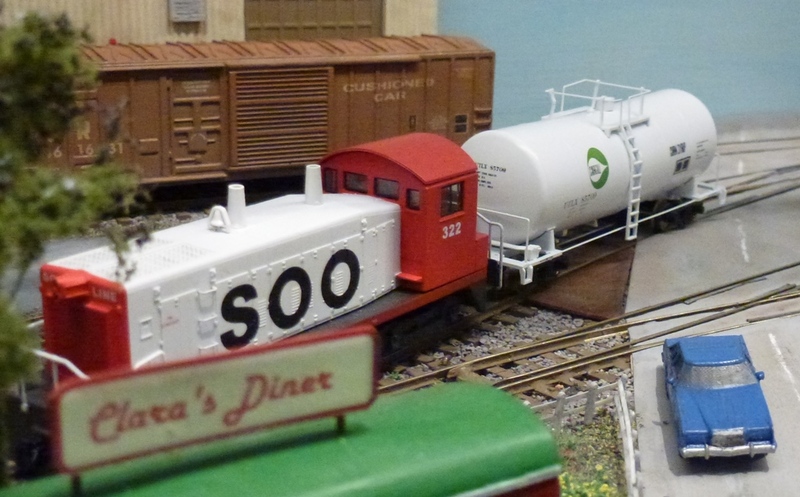 Shapeways have a variety of TT scale road vehicles and loco and freight car body shells from designers such as Madaboutcars, TT Nut and Stony Smith Designs. 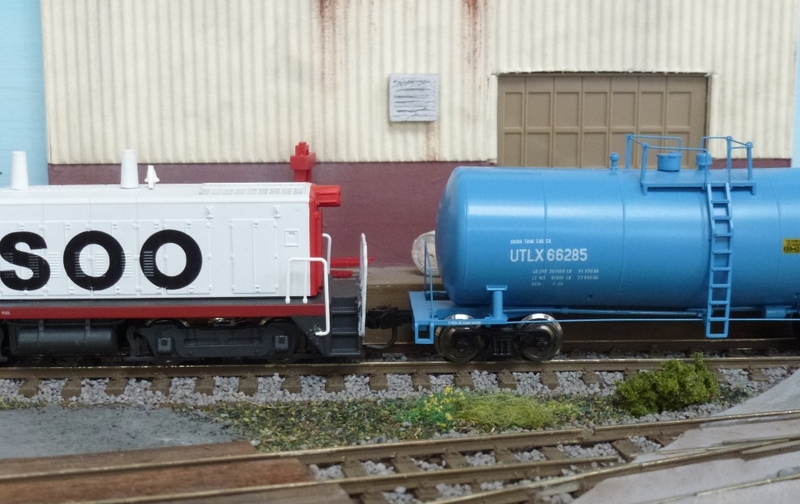 Gaugemaster – UK-based suppliers of Preiser TT figures. 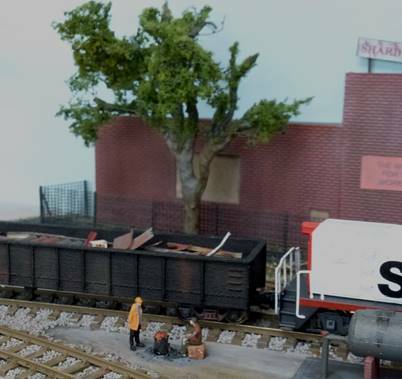 Auhagen produce TT scale buildings and scenic items, some suitable or adaptable for US outline. Here are some other stockists of TT items which I have not used as yet. Art&Detail - a German supplier of a limited range of US freight car kits, loco kits and components. Tillig and Kuehn – German suppliers of 12mm gauge track, probably more prototypical for TT than Peco HOm. TT-West – a US-based supplier of a limited range of decals and kits. 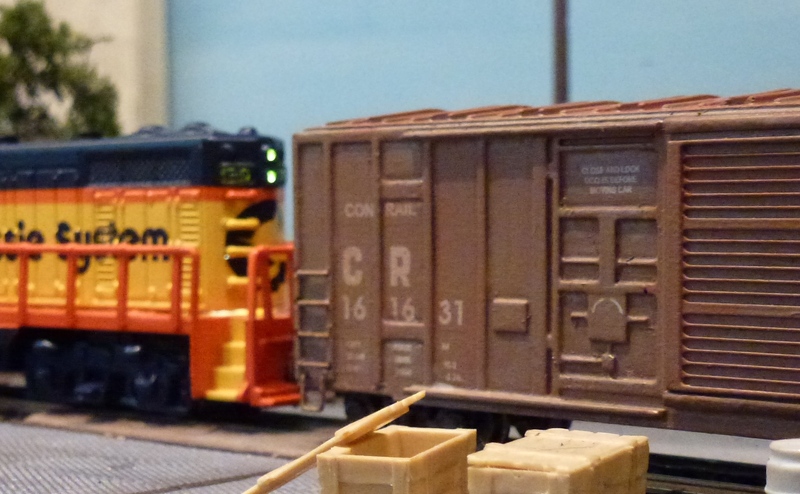 Siggis – a German supplier of US freight car kits. 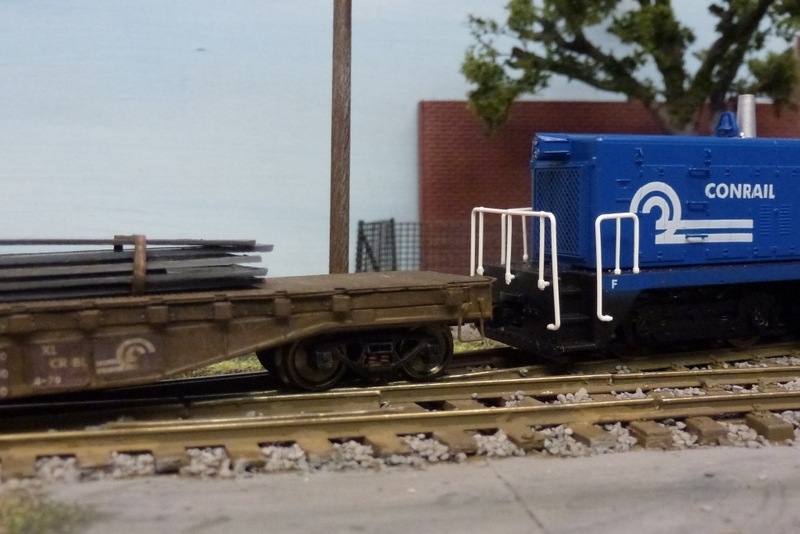 Muellerradsatz – a German supplier of 12mm gauge wheelsets suitable for US freight cars. Various printable kit suppliers e.g. 3DK, Clever Models and modelbuildings.org, whose kits can be downloaded and printed at 1:120 scale. A busy day at Naples Street as all industries work to capacity. In its June 2016 issue Model Railroader carried an article entitled ‘What became of TT scale?’. It started off ‘TT scale has disappeared from our consciousness’ and disappointingly, it made no mention of any of today’s small suppliers. 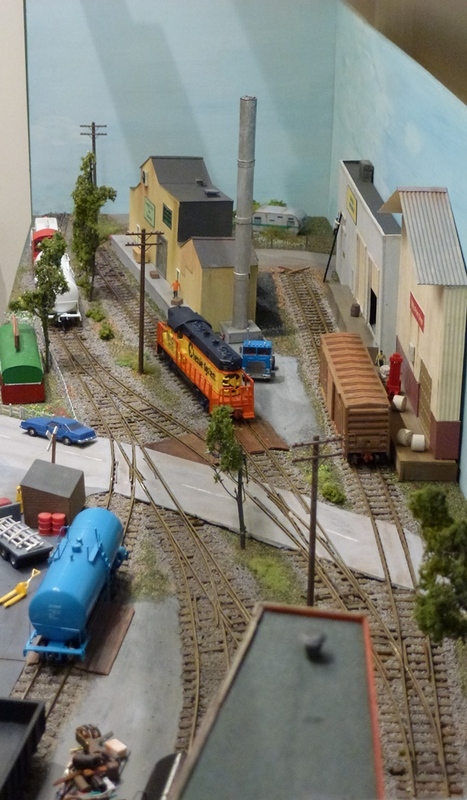 While it will most likely always be a niche scale, I hope that a visit to the ttnut.com forum will reassure readers that American TT is alive, and that my small layout helps to bring it back into the consciousness!